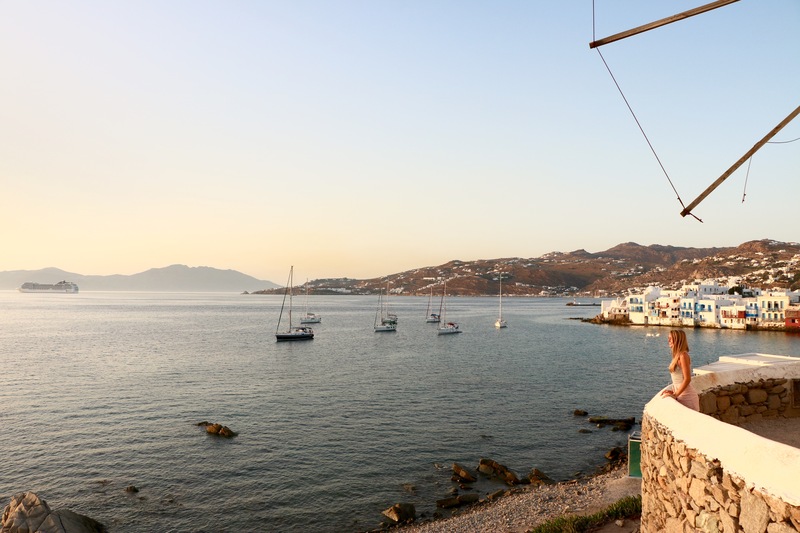 The gorgeous, colourful, party island of Mykonos is definitely a destinations that should make your bucket list! 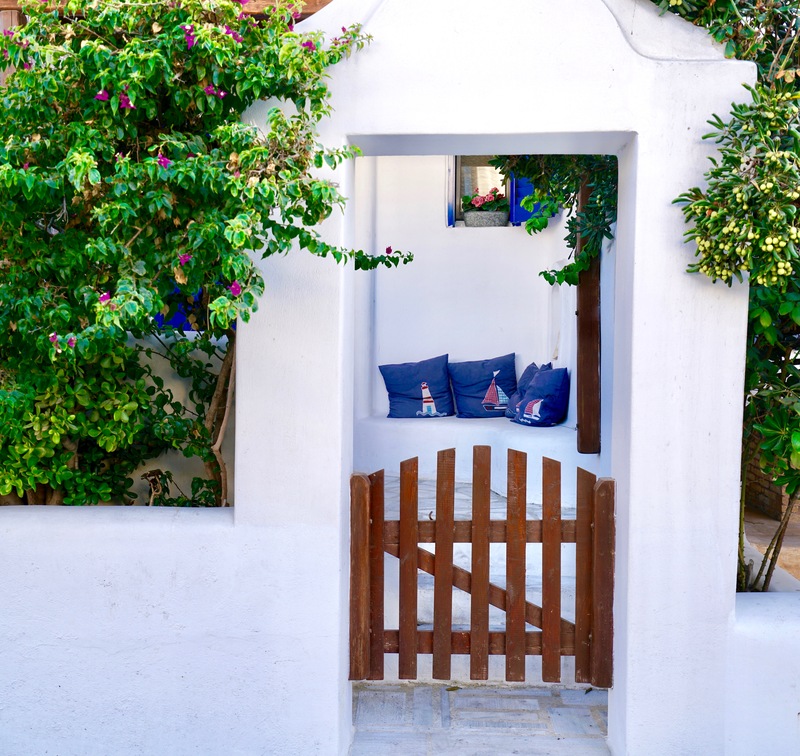 This Greek Island is know for it’s beautiful beaches, spectacular weather, iconic windmills and wild nightlife…and let me tell you, it didn’t disappoint in any of these areas. 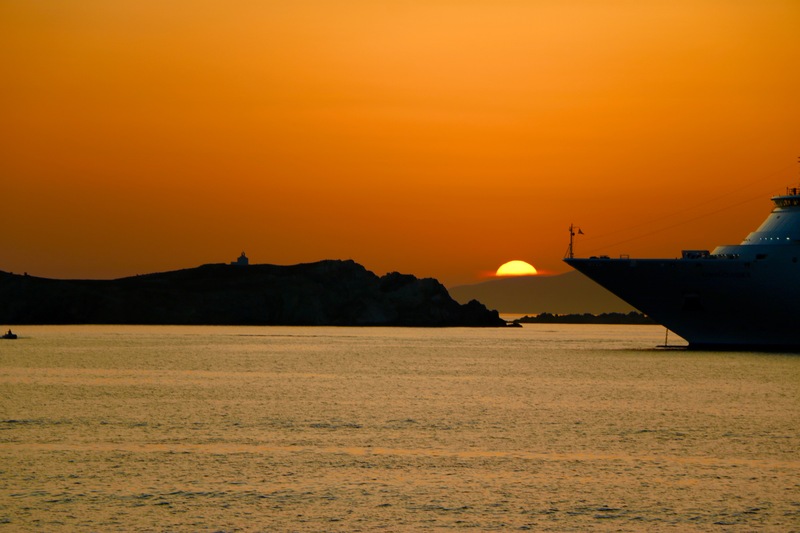 Going to another Greek Island other than Mykonos? 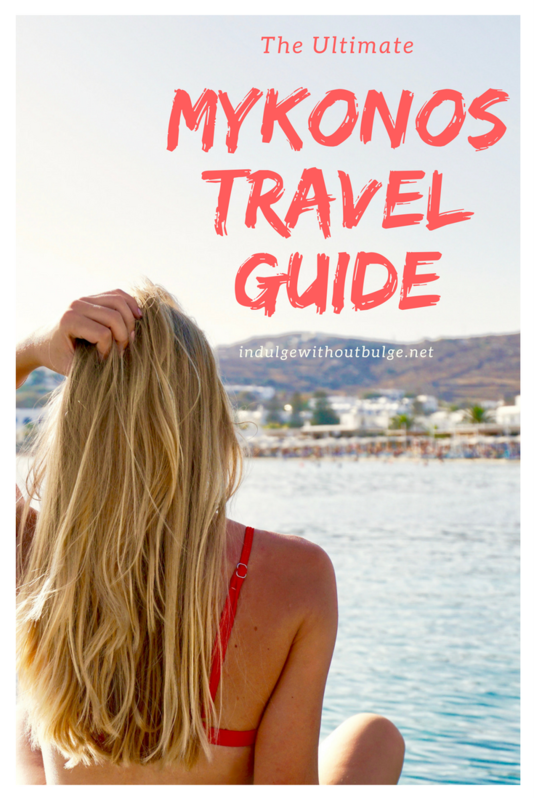 Check out my Greek Island Travel Tips. Ornos Beach – this was my favourite, of all the beaches we visited. It was clean and had a great atmosphere, with crystal clear warm water and a stunning view! Psarou Beach – this was a great spot to unwind, with powdery sand, beautiful water and more of a family/honeymooner atmosphere. This is also a great spot for windsurfing and water skiing! Paradise Beach and Super Paradise Beach – love to party!? These will be your favourite spots on the island, with live DJ’s, open beach bars and parties till sunrise every night of the week. Below: Ornos Beach (first) Psarou Beach (second). 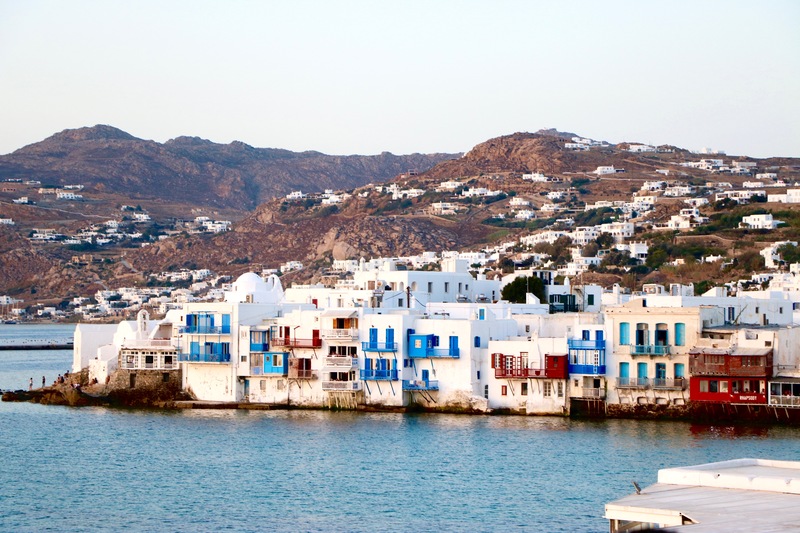 Little Venice – this is a magical spot to eat or enjoy a drink, after watching the sunset. It has a beautiful view of the windmills, a buzzing atmosphere and an assortment of restaurants offering mouthwatering seafood dishes. 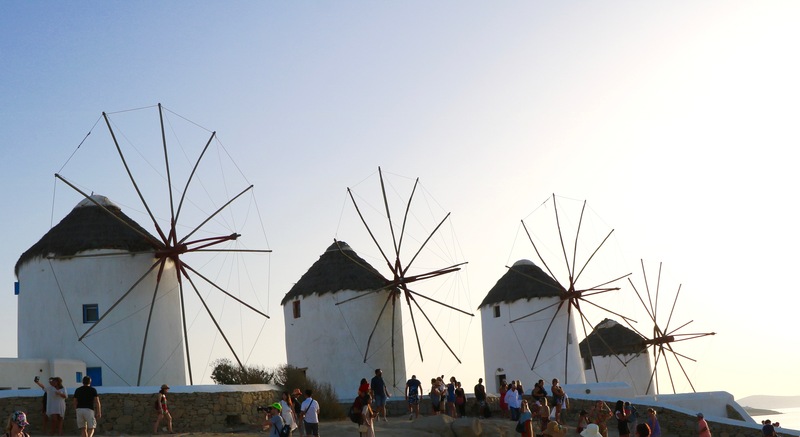 The Windmills (Kato Mili) – these iconic windmills are one of the best places on the island to watch the sunset. However make sure to get there early, as it fills up quickly. Paraportiani Church – this is one of the most famous of the 365 churches on the island. Day trip to Delos – We didn’t get a chance to do this trip, but I’ve heard great reviews from friends who have done it! You can find freshly squeezed orange juice just about everywhere. Perfect for a light and refreshing snack throughout the day, or while at the beach. Bowl. is a delicious restaurant offering an assortment of healthy dishes. Purchase large water bottles at the grocery stores to carry around with you all day. This way you can stay well hydrated in the hot sun and this will help to curb “beach boredom hunger” too. You MUST try the Greek yoghurt! It is insanely tasty, while also being high in protein, low in carbohydrates and containing probiotics. Try the seafood dishes, since they are incredibly fresh and for most, are unlike something that you can get at home. They take credit cards in almost all shops, cafes and restaurants. The island is casual, therefore no need to fill your suitcase with fancy clothes. At night, the partying gets WILD! Make sure to take photos of all of your important travel documents (passport, credit cards, health card, etc.) and send it to a friend/family member, just incase you have these on you while partying and they go missing. If you have any comments of questions I would LOVE to hear from you! 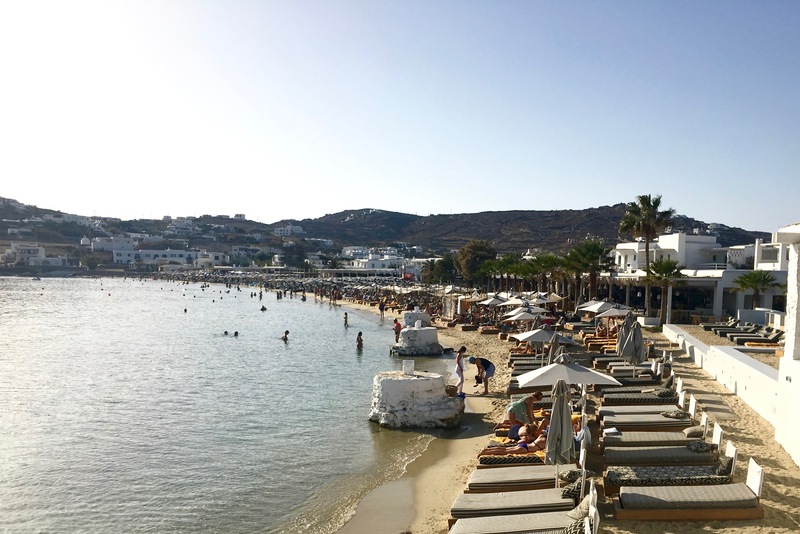 I hope that this post has helped in your Mykonos travel planning.